Say Goodbye to Contacts and Glasses! If you are determining when to get LASIK eye surgery, there has never been a better time for this procedure! With Dr. Parker’s experience, the advanced, customized technology, and financing options available, there’s no reason to wait. You may schedule surgery with our patient care team by calling 866 DR LASIK (2745). If you prefer email communication, please complete the Schedule LASIK Surgery form and be sure to let us know your preferences for the surgery date and full dilated pre-operative exam. *Please Note: There is a one-day post-operative exam first thing Saturday morning. For your convenience, if you reside more than 50 miles from our Cape Girardeau office, we will take care of hotel accommodations for you for one night. Some patients opt for a pre-operative exam on Thursday, hotel accommodations Thursday night, surgery on Friday drive home to see their regular eye doctor for the one-day post-op on Saturday. Just let us know your preference. There is a one-day post-operative exam first thing Saturday morning. For your convenience, if you reside more than 50 miles from our Cape Girardeau office, we will take care of hotel accommodations for you for one night. Some patients opt for a pre-operative exam on Thursday, hotel accommodations Thursday night, surgery on Friday drive home to see their regular eye doctor for the one-day post-op on Saturday. Just let us know your preference. Are you in contacts or glasses? When do I have to be out of my contacts? We know it is not easy to wear glasses once you have worn contacts for many years. However, this is a very important step toward your successful LASIK procedure. We try to accommodate contact lens wearers by scheduling the pre-op exam as close to the surgery date as possible so you are not without your contacts any longer than necessary. Sometimes this exam can be as soon as the day before your procedure. How much time do I need off from work? Plan for a 1 1/2 to 2 hour dilated pre-operative exam prior to surgery. The day of surgery the actual procedure only takes about 10 minutes per eye. Although you are only in our office for a little more than an hour, you should schedule the entire day off to relax, take a 2-3 hour nap after surgery, and limit your activities. You are back to most normal activities the following day. 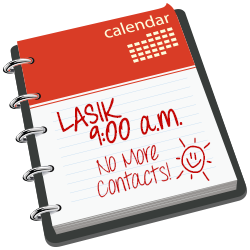 Our Friday LASIK schedule facilitates a postoperative exam on Saturday morning, reducing time off from work. At the one-day post-op exam, Dr. Parker will release you to drive. Depending on what your occupation is, you may go back to work one to two days after surgery. Typically, you are seen one to two visits prior to your procedure. Often we combine a screening and pre-op exam if you have a limited schedule, have already been told you are a good candidate for LASIK eye surgery, or have to travel a long distance. You will need to be off the procedure day and will be seen the following day for a one-day post-operative visit. This visit is on Saturday morning to help alleviate time off from work. You will also have five other post-operative visits over the next year. There is a 1 1/2 to 2 hour dilated pre-op exam that will need to be performed prior to the day of your procedure. This exam cannot be on the same day as your procedure but can be as close as the day before surgery to help minimize the length of time you are without your contacts. We recommend having a driver for this exam. You will need a driver the day of the procedure. Plan to be in our office for 1 to 1 1/2 hours the day of your procedure. You will need to take a 2-3 hour nap the day of your procedure and be prepared to take the full day to rest and relax. You will be unable to wear eye makeup for one week and unable to go motorcycling, horsebackriding, swimming, or use a tanning bed for two weeks after your procedure. NOTE: You may see Dr. Parker for your post-operative care or you may choose to see your regular eye doctor for these exams. If you choose to see your regular eye doctor, these exams are still included in your LASIK fee, we simply reimburse your doctor for these visits and receive reports that keep us up-to-date on your progress. How long is the recovery period, any limitations? The LASIK eye surgery recovery is minimal. You should plan to have the day of the procedure to rest and relax and you will need to take a 2-3 hour nap after your LASIK eye surgery. You will begin some prescription drops after your nap which you will continue to use for one week. You will also use preservative-free artificial tears over the next few weeks. At your one day post-op visit, Dr. Parker checks your vision. He will release you to drive at at this exam and you likely will be able to resume most normal activities. I want to know every step of the procedure! I want to hear a patient’s point of view!